A unique feature of Aqua Solutions proprietary membrane is it's ability to remove contaminates by ultra-filtration using only low pressure supply water. Advanced technology filter fibres are designed to provide a high water flow while using very low water head pressure, As little as 1 metre water head pressure. Using a 2 meters to 4 meters head pressure (20 kPa to 40 kPa or 3 Psi to 6 psi) will achieve a steady production output of about 10,000 litres per day subject to the quality of the raw sauce water. Water permeates billions of microscopic pours in the outer walls of thousands of tiny hollow fibres where the filtration process occurs. Clean purified water travels through the fibres eventually collecting in a canister at one end and flowing out as drinking water. Aqua Solutions systems can be used for supplying potable (drinking) water from various sources including wells, dams, creeks, rivers swamps and also poor quality town water supplies. 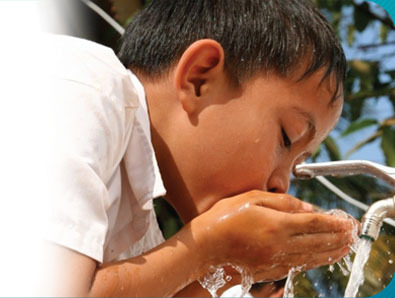 Schools, health clinics, isolated communities and villages can have access to clean drinking water. The Aqua Solution Systems can be used for commercial operations such as setting up water vendors or as a pre-treatment to reduce loadings for reverse osmosis plants. The Aqua Solutions System can be used for long or short term durations and if needed are safely stored away for use at a later date.